If you have an inactive or expired Colorado license, or a license from another State: CLICK HERE to see a pdf containing educational and testing requirements. Need some practice help for the test? CLICK HERE for information about our ONLINE Exam Preparation Practice Exams, Courses and LIVE Exam Cram Workshop. Prior to submitting an application for a license you need to submit a set of fingerprints to the Colorado Bureau of Investigation for the purpose of conducting a state and national criminal history record check. You can submit your fingerprints at any time - you do not need to take classes, test or bring a special certificate. You just make an appointment at a state-approved IdentoGO fingerprint location and let them know when you arrive that you are getting a real estate license. For information about the background check and options on how to get and submit your fingerprints CLICK HERE. Once you have completed your required education, you will receive a certificate from us that will qualify you to take the state exam. You can contact PSI to schedule your exam at www.psiexams.com (for help on the PSI website go to our FAQ page). The exam fee is $45. You must pass the examination before applying for a license. CLICK HERE to see additional information about the test with a complete description of examination content. It is important to understand that the process of finding an employing broker is the exact opposite of looking for a job: You interview the broker, not the other way around. There are many factors that come into play when choosing a brokerage to call home. CLICK HERE to read additional information on "Finding a Job as A Real Estate Agent"
We have partnered with a free website, Realty Connection, that will help you compare the various services and options that many of the brokerages offer. CLICK THE LINK BELOW to explore available Brokers looking for Agents. If you have been or are licensed in another State(s); you need to obtain a certificate of license history from each jurisdiction. If the other license is current (active or inactive), the certificate must be less than 90 days old when you submit your Colorado application. Your employing broker must agree to your application for a real estate license. Apply for your license within one year of passing the examination. Obtain Errors and Omissions insurance – not expensive, but speak with your new employing broker before ordering. 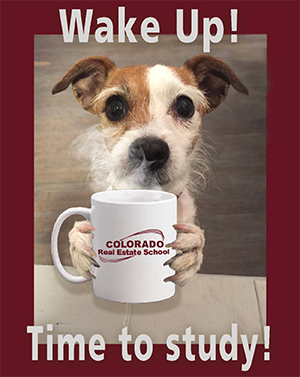 CLICK HERE to register and set up your account with the Colorado Real Estate Commission. From there you will submit your application online for your license.